If you're marketing a product or service, you may be tempted to write your own copy. As a direct response copywriter, I have worked with several clients who are copywriters -- or have written copy. The skill level varies from competent to excellent. Many superb copywriters get tired of writing direct response copy and so they "move up the ladder" into management or they enter a complementary field. For example, they start to sell information products or get on the speaking circuit. Or both. These "former" or "retired" copywriters often hire direct response copywriters to write their copy. They might tweak the copy but, by hiring a copywriter, they save time so they can focus on their new business. Writing direct response copy -- depending on the product -- can, in fact should, take several days. The "former" copywriter will find a copywriter who can write in roughly the same style. I will complete the job but it will be unpleasant and not provide much in the way of satisfaction -- plus the work may be poor ... so poor that I may have to hire someone to come and fix my work. The bottom line when it comes to writing your own copy is exactly that -- the bottom line. Ask yourself a couple of questions. 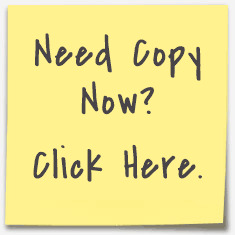 How much do you want the copy to earn? If hiring a professional and experienced direct response copywriter doubles your conversion, how much will that be worth to you? The first question is the most important. If the copy must generate $100,000 in gross revenue, do you want to risk not getting the revenue by writing your own copy? A fee of around $5,000 now suddenly seems like a good investment -- especially when you test. Let's say your copy generates $25,000 in revenue but the professional copy generates $200,000 ... well ... ditto ... a fee of around $5,000 now suddenly seems like a good investment. Look -- there's nothing wrong with writing your own copy. But the investment in a direct response copywriter will almost always pay off ... especially when you test. I will blog next time about testing.